This weekend was my first time playing Orleans as a 2 player game. We got started sort of slowly, but we still managed to squeak a game out in just over an hour. This game is really satisfying in that you feel like you can take a ton of actions by the end of the game. There are definitely numerous strategies that will take you to victory. Even though it is a Euro Game with no real story elements, I really feel a bit like a medieval noble as I recruit characters and determine how my fief is going to develop. The Meeple Source upgrade for the kickstarter ran about $90. The upgrade included all of the different classes of characters that a player can recruit during the game. The upgrade did not include any pieces for the Craftsman tech upgrades, the goods, or the citizens that are worth victory points at the end of the game. Those meeples included had a very nice paint job and all had a regular shape so that you can’t feel the difference in the bag. I thought that the shape of the meeples might bother me compared to the discs that were supposed to be used with the game. The other slight negative about these pieces is that the starting pieces are not marked in any way. You have to mark them yourselves. I took just about 2-3 minutes with some of my miniatures paints to mark the bottom of the feet of all the starting pieces with the proper color. This meant the pretty art on the front and back of the pieces was not disrupted by some ugly hand done strips of paint. I also took some old copper, silver, and gold coins from a LARP that I used to play and used them for the coins for Orleans. The tactile feel of metal coins for this game really ramps up the theme. I could not even imagine playing this game cardboard coins. The sound they make as they clank is great. I set out the goal of trying to replicate the kickstarter deluxe edition so that I could experience this game as I did when I played a friend’s copy at a convention. I just couldn’t believe the massive amount of money people were selling the game for for that edition. I couldn’t find one for under 185 dollars. Well, after supplying my own coins and getting the amazing meeple pieces, I’m still not done meeting the upgrades of the deluxe edition. I’ve already spent almost 150 to get it to that point. I don’t regret it at all. The meeples are really amazing and the coins that I added are quite good. This leads me to the conclusion that instead of tracking down rare copies of some games, if you get a lot of premium components, you can use them to upgrade all your games. I use these metal coins for every game that I can, and it makes the games so much better. 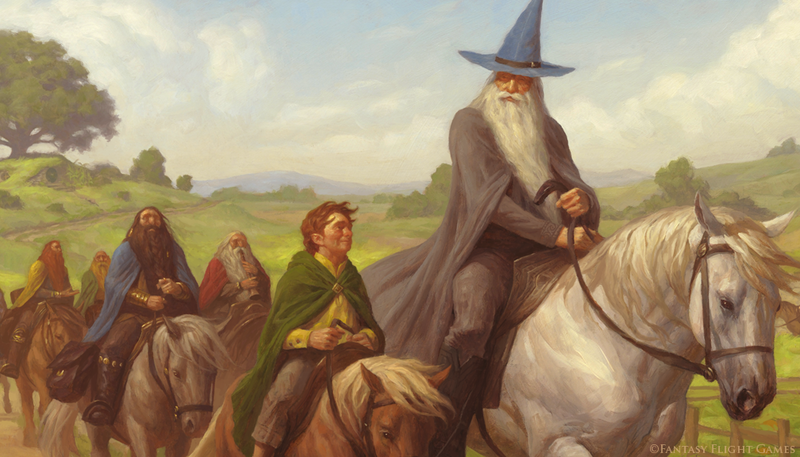 I recently introduced some friends to the Lord of the Rings LCG. They are interested in story elements in games and they like the books, so I decided, well let’s play the Hobbit quests. I’d forgotten how wonky some of those quests are and I don’t think I’ve ever had bad luck with the wonky elements in the past run throughs I did with these quests. I’m also pretty sure that these quests are just not good as early intro quests for people to play. The way that the staging areas split and some of the rules exceptions from the quests, it starts to get pretty confusing. I do normally really like this game, but I think that with these quests, 4 players just really adds some serious complexity to the way these quests are designed. I’ve played the first two quest lines and the Khazzad Dum box quests so many times, and I really didn’t want to dive back into those. I was also thinking that I didn’t want to do a different cycle quest line, because for some reason, I thought the story wouldn’t be as good. Now, after playing through most of the Hobbit quests, I’m pretty sure that the story playing out in the cards is actually a little weaker. I think this must have something to do with the fact that the quests need to follow the path of the books instead of building their own natural narrative. I’m still very excited to delve deeper into the quests that I’ve never gotten to play. I did get to play test most of the quests out now, but I stopped being interested in that, because I started finding that I was less excited to play the new quests when they came out. Now with a bit of separation and with a lot of card organization, that I will get into later, its time to explore again. Welcome to my little corner of the internet! I had grand plans to launch this blog at the start of the year, but 2 rounds of strep throat got the better of me. Now, I am feeling better and so glad to be getting to updates! I suspect you are either here because you already know me in person (Hi Friend! ), you met me on social media somewhere (isn’t it great to live in the future? ), or something in this blog came up in an internet search. In any case, welcome! I got to throw down with a friend in Don’t Turn Your Back, by Evil Hat Productions. Its on kickstarter for just a couple more days, so if the sound of this game intrigues you, better go check it out now. Its close to its funding goal. I like the graphic design of the board and the cards. It is actually really easy to see if cards have been played in a legal spot and quite easy to not screw it up. My friend picked up the game from a quick 2 minute explanation very well. Essentially, each player starts with four cards from their deck each turn. You each take turns playing one card each onto the board as “workers” and go until all players are out of cards. The smart way about how the game works is that individual cards can only be played in a few of the spots, not just any spot. So there is some variance to the game to work with. I didn’t quite grasp just how interesting the various spots on the board were for laying out a solid deck building mechanic. You can go for victory points early, in the high school, which reminded me a lot of how Race For the Galaxy can play out. There is a City of Slumber section, where, the points you play there let you buy better cards later. The Encasing area is where you can destroy cards. Don’t Turn Your Back has no wasted turns. You know when you play a deck builder and you have a few turns where you really don’t get to do much of anything? You know when you just can’t find a way to buy any card that will help your strategy? Well this game skips over that with each card having a good value to it. Also, the speed of play is aided by all the cards only getting to use special abilities if played in the Bazaar section of the board. Finally the Warehouse section of the board adds laws every turn that give variable benefits. This is a GREAT way to have variance and make the game not have a single winning strategy each time. I am so excited to try this game out with four players, as I think that the competing for various spaces on the board will be a lot more interesting. If you like light worker placement games, games with direct competition, or deck building mechanics put in to non-pure deck building games, this is a game you really need to try. Alternatively, if you like darker themed games with very intriguing artwork, this game may hit the spot for you as well. I’d like to start with initial impressions of Don’t Turn Your Back, currently on kickstarter from Evil Hat Productions. Then, in a later post, I’d like to go with my review after some more game play. When I watched the initial tutorial video for Don’t Turn Your Back, I was feeling sort of disinterested. I’m not sure why, but, after reviewing the rules for myself and testing out a little game play, I found the game quite intriguing. Its interesting in that I was thinking that the amount of cards that come in the game is very minor compared to most “deck building” games. Though after figuring out the way the game plays, it felt appropriate. I went from thinking that the game would only be viable with lots of stretch goals or expansions to thinking that such things could actually mess up the balance. I often do like to use catch phrases like deck building and worker placement and such to interest friends that are in to these mechanics. In this case though, with the way the play types mix, I think its actually more interesting to try to entice people by explaining the creepy theme. It feels a bit like it should be a Silent Hill game. I never really played Silent Hill, but my friends all did. And I think that this game gives my imagination the same sort of feel. In some ways, this game almost feels like an interesting variant on a classic strategy game like Chess. The mechanics are not the same, of course, but each player having their own deck of acquisition cards makes for more of a who plays the cards better rather than who gets the cards that best match their strategy. So after Christmas (which by the way was a bounty of nerdy gifts that I will get into later), I picked up Caverna to fill out a vital piece that was missing in my collection. I’ve found that I really enjoy worker placement games, and yet, somehow, I still didn’t own a true worker placement game. I had already played Agricola and it was pretty good, but I kept hearing about how Caverna was just a newer, better version of Agricola. So, I sort of blindly bought it, based on the recommendation and the fact that it appeared similar enough to Agricola that whatever minor changes couldn’t possibly make it so different that I wouldn’t like it. So, I’ve played a few games now, none of which has more than 2 players, so I can’t speak for large player games, but I can speak very much so for the game with fewer players. The way the board expands and shrinks for the number of players is great for keeping a certain balance and also a certain freshness to the game. I can’t wait to play with a different number of players other than two to see all the actions we’ve never been able to take. Creating new workers in Caverna is a lot easier than it was in Agricola. Essentially, there are certain spaces on the board that allow you to create workers, and if those spaces are taken up before you get a chance to go, you can’t get a worker. With this game, with 2 players, about 1/2 to 2/3 of the way through the game, there are two different ways to get new workers. With additional players, there are even more workers. There are no cards for this game, other than the reference cards. Instead of having technology and occupation cards or some other type of mechanic, you get to choose your theme based on the buildings you buy. The buildings are available at all times and out for all to see. There are two different sides to the buildings boards to make the game simpler or to give more options depending on the players and length of time you want to play for. Though, I think after one play through with the easy side, it is much more fun to add all of the buildings. On my last play through, I ended up getting the prayer chamber, a weaving room, and a brewery. I felt so much like my dwarf tribe was actually just an abbey in southern Belgium, selling delicious beers to the locals and staying pacifist. These game adds adventuring with weapons, which is sort of a wild card action that can get you a number of items or actions, so you can get a lot of things even if others have already taken up spaces with those items that you wanted. The game seems pretty easy to teach and understand, everyone I’ve shown the game to has gotten it before the end of the second turn. Since the game is so much about scoring points, it is advisable to let people see the scoring pad so they aren’t blind sided at the end of the game with what they did. Overall, I suggest this game is not for non-gamers, but gamer families and friends that don’t want to play dice rolling games or games with violent themes could like this game. Really, I would suggest that anybody gives this game one solid play through. Even if you don’t grow to love Caverna, you’ll probably grow to love the Worker Placement mechanic. The points system in this game really enforces you to be thematic if you want to win, which is very interesting. 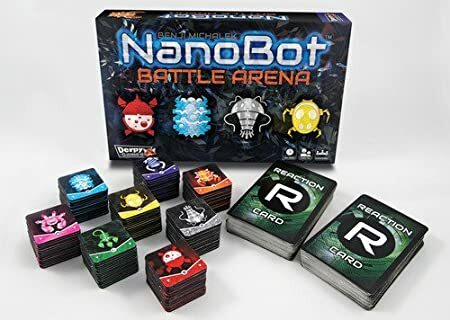 I recently got the opportunity to try out Nanobot Battle Arena from Derpy Games. I like the sound of a theme that is a future where battles with Nanobots are a regular occurrence. It invokes my imagination to see a number of speculative sci-fi scenarios. When you get set up to start playing, you’ll get a “character” card that will go with the colors of nanobots that you will use during the game. This card has a description on it about the type of nanobots that your scientist is using. At first, we thought that these cards were actually rules descriptions, but they are actually theme. The theme was neat, but it wasn’t clear that it was not a rule. Essentially, there are 8 types of actions in the game, and each color of bot is going to get a bonus of 1 to the associated action to its color. The point of the game is to lay down all of our nanobots before anybody else can and to have the longest continuous chain of nanobots. Each turn is as easy as Sentinels of the Multiverse. You lay down one nanobot, you play one card, you refill your hand to five cards, and then you’re done. The cards are simple, with just a number, a color, and a name of the action. The rule book clarifies what each of the different actions does. It would probably have been helpful to have a little card that could be set on the table and explain the actions. The draw deck of action cards has to be separated every game to draw the starting hands for each player, because you are supposed to get a certain number of action cards with a certain number of actions on each card such as 3, 2, or 1. This is a big hassle for a game that should be a short and quick game. I tried my best to plan ahead in a four player game and try to set up a big play to have a long chain. The big problem is, if its not going to bring you or someone else up to 15 nanobots, it doesn’t matter. Someone else will easily screw up your long chain before the game will end. There is a suggestion that you can buy a number of extra boxes to make the game last longer. I can’t honestly see any beneficial reason for doing this. The game can just about go on forever with the limit of 15 nanobots if you’re playing with a few players. The ability for people to gang up on anyone that might be ahead makes it very easy for the leader to get torn down. The game really would have benefited from a play mat. It is hard to keep track of where the nanobots are located in reference to each other once the chains are broken between different groups of tokens. Playing this game with more than 3 players is, in some ways an exercise in frustration. If you wanted to play a very casual game where everyone is drinking and socializing and you just wanted to occasionally do a few turns and just pass the time, this game may be suitable. What happens between your end turn and the start of your next turn will change so much that there isn’t much need to pay attention. The rules are unclear in a number of small instances that add up to make the game need a number of house rules. Also, sometimes cards or rules use different words that mean the same thing, making for some confusion as to what happens to your nanobots. What about with 2 or 3 players? I found the game most pleasing with 2 players. 3 players would do at a stretch. This is a very light game, and you shouldn’t expect a grand strategy to really play out in this game. The game says 14+, but after playing with 2 players, we came to the conclusion that the game would actually play best with 10+ instead. Savvy kids that are age 8+ may also be able to play. The basic rules are really quite easy, and it really has the appropriate level of tactics for kids that don’t think in that way. With a few tweaks and extra components, this game could have a chance to be interesting for strategists and family gamers in smaller numbers of players.